Update, February 24: As you already know, Emily Ratajkowski got married in a surprise City Hall ceremony on Friday. On Saturday, she took to Instagram to share another glimpse at her nuptials: a video showing off her pretty gold ring, which she complemented with another similar ring on her pinky finger. While we love massive diamond rings as much as anyone, her choice of a minimal gold band feels decidedly refreshing. Congratulations again to Ratajkowski and her new husband! Originally posted on February 23: After Amy Schumer had a surprise wedding last week, Emily Ratajkowski just made the unexpected revelation that she got married at a City Hall wedding in New York City today. In her Instagram Stories, she posted a series of five photos revealing the news and also shared a photo with engagement ring emojis. The model, wearing a Zara Long Belted Jacket ($129) and Flared Trousers ($70), married Sebastian Bear-McClard, an actor and producer. 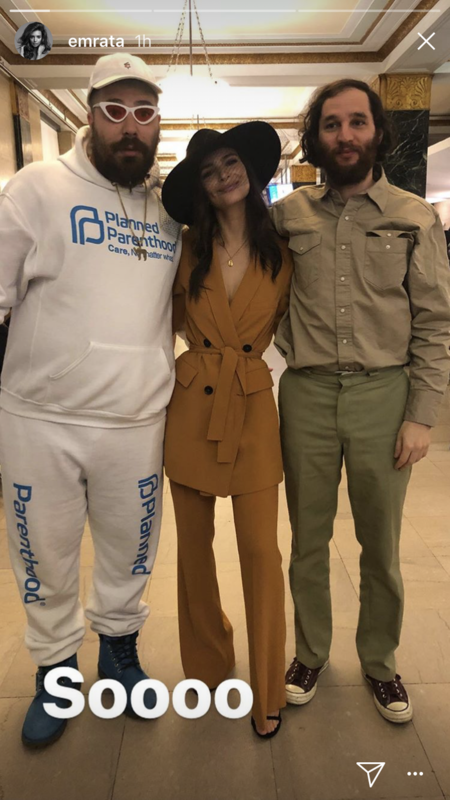 One of the witnesses in attendance was none other than Instagram star The Fat Jewish. Stay tuned as we learn more updates. Congratulations to the happy couple! Read on to see Ratajkowski's photos and shop her Zara pantsuit.